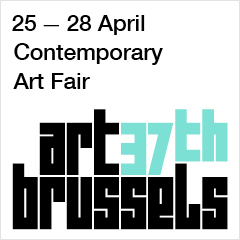 Co-curator Lise Coirier gives a virtual tour of the Crystallized exhibition showing at Spazio Nobile in Brussels until April 15. When entering the space of Spazio Nobile, the impact of the colours, glaze, softness, beauty and repetition of Antonio Lampecco installation can be felt immediately. 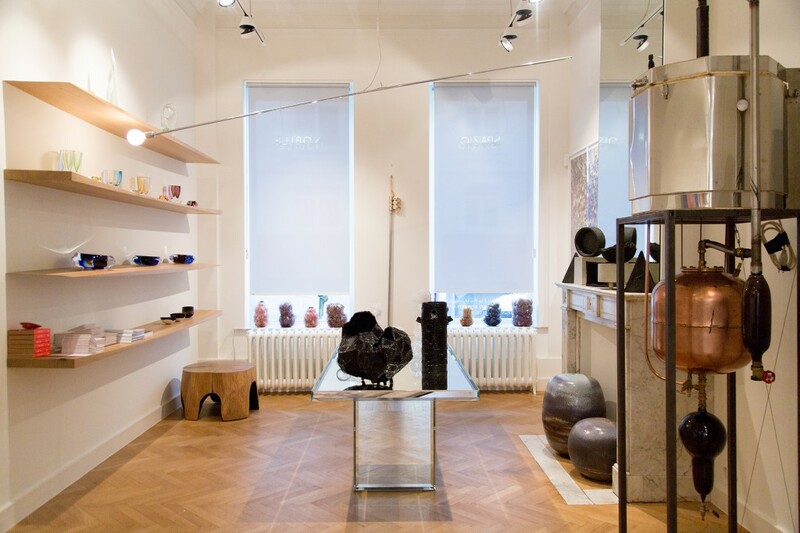 Lampecco is 84-years old and has learnt how to take advantage of working slowly, following his rhythm and the one of nature, especially when composing his crystalline soft glazed sandstone pieces. He also prefers the closed form to avoid creating vases. 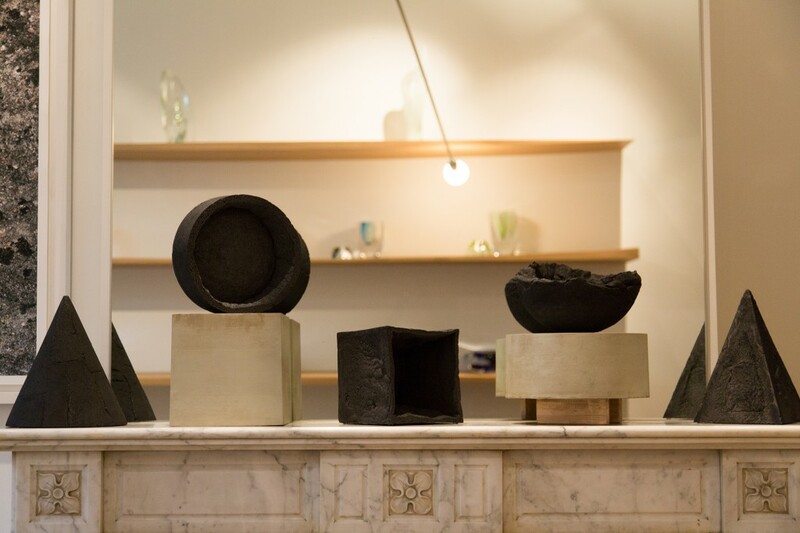 He has learnt through the years of active experimentation how to shift from the utilitarian shape to sculpture. The green surroundings of the Abbey of Maredsous and his inner travels and memories from Italy, are translated into his conceptually-driven ceramics. The same kind of effect is provoked by the lacquer artworks made by Ming-Zhong Chen and Yu-Ju Lin, with Richu Lacquer Art Co and Convey The Mind. The ostrich eggshell, bodiless lacquer, natural lacquer paint and pearl inlay deliver totally different effects. Eggshell is so delicate that it requires extra care while the bodiless lacquer looks heavy but is actually light and tough. The natural lacquer paint and pearl inlay create a micro-universe. These really are works to be cherished. Younger designers, of which there are a few in this group show, tend to play with both with the natural and the artificial. 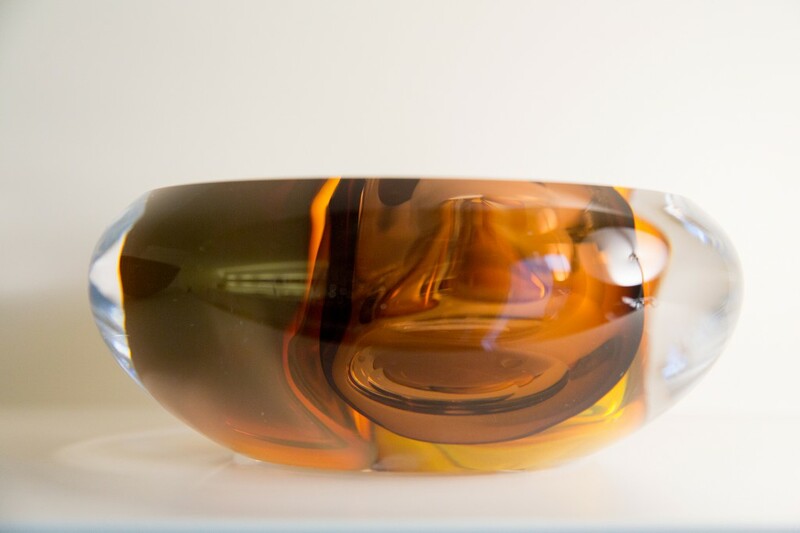 Nature appears both in the use of materials such as propolys, glass, clay and wool, as well as in confrontation with coal, acrylic and oxides, entertaining a dialogue with Mother Nature’s craft. Photographer Frederick Vidal’s Entropia series shows how these invisible forces are central to these designers’ creative process, as with land artists too. 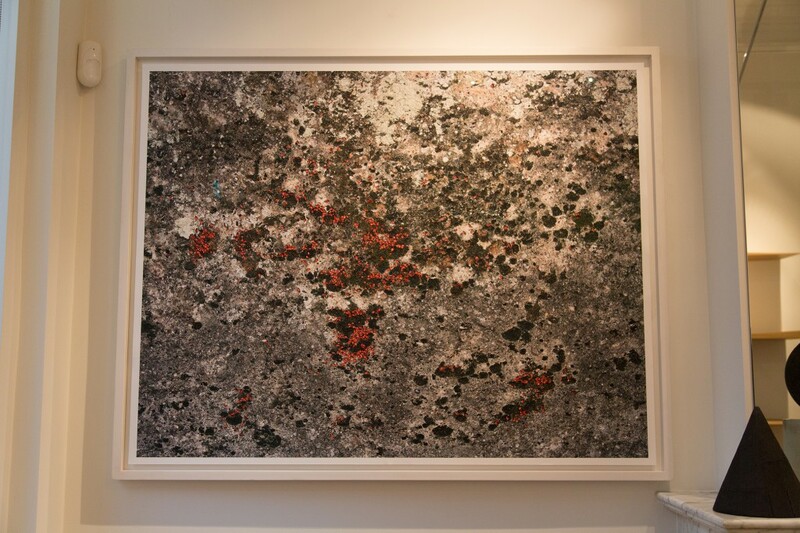 Another photographic series, by Tom Joyce, investigates microstructures inherent in iron. As iron cools, it forms a distinct dendritic pattern, as unique as a human fingerprint, which determines the strength of the material. Another example of the man vs nature is Philipp Weber, who uses coal to understand a fragment of the Earth’s heritage in From Below. The work questions human competence and its consequences on the fate of our planet. 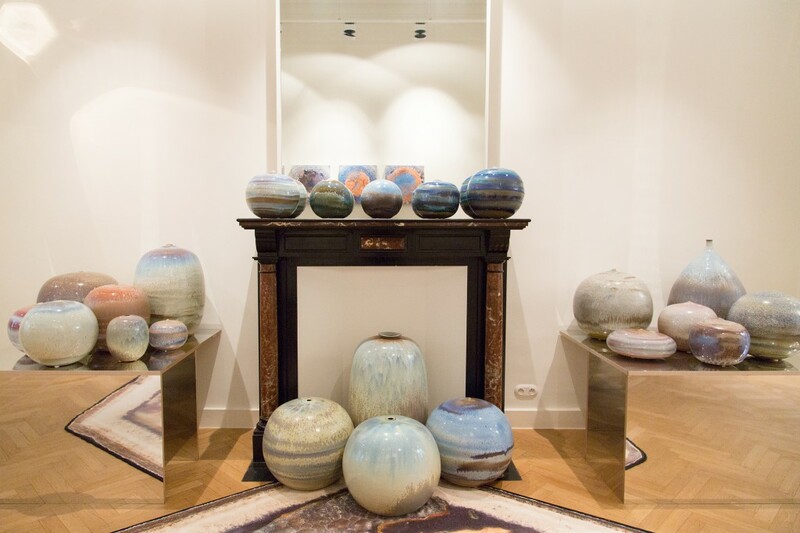 A Strange Symphony and On Colours, also on display, show the origins of his innovations with natural processes that emerged from his experiments with Belgian glass blower Christophe Genard. 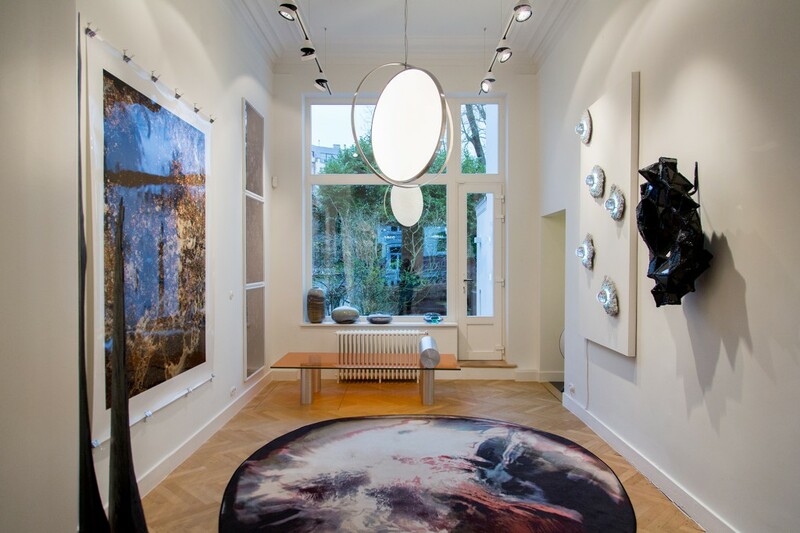 Making a turn towards design fictions is the installation of metaphoric rugs done by GGSV, which is about a meteorite that fell from the sky onto the globe without being volatilised. Chen Chen and Kai Williams have created Caviar Sconces through and about non-linear design process – they are representations of nebulous ideas that condense into an object from disparate parts of your mind. 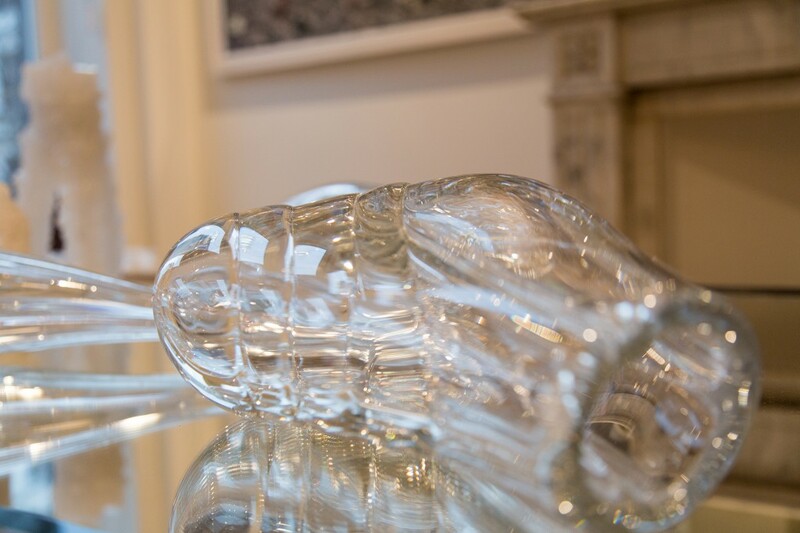 Made specially for Spazio Nobile, Marlene Huissoud’s Of Insects and Men installation uses discarded glass and honeybee bio-resin to explore “the viability of utilising insects and their waste streams to create future craft artefacts”. 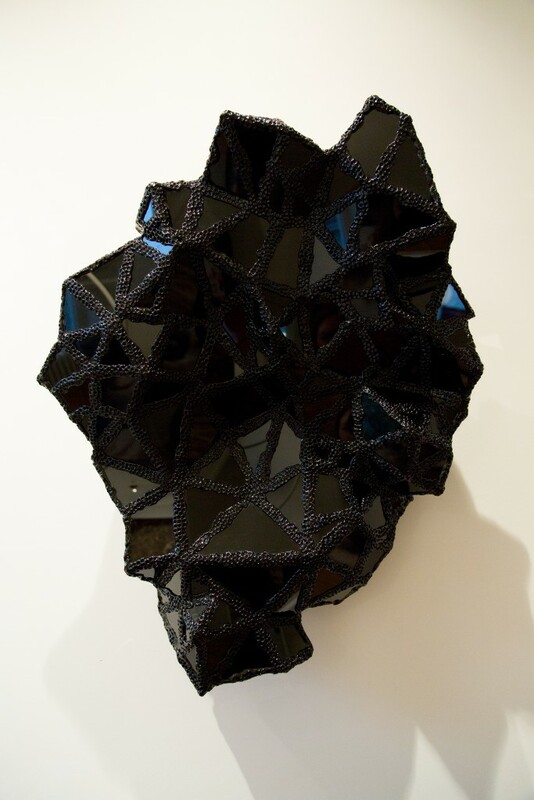 Isaac Monté also made a new crystal series specially for Spazio Nobile, called the Five Icons of Design. Using stalagmite crystallization processes to cover five of the world’s most significant designs, he has changed their function from product to art. “It can be compared to amber, a precious stone in which insects and leaves can be found from time to time. These fossils are of high value for the history of evolution. The series can be seen as an ode to the iconic design objects and it is a way to preserve these important icons for the future,” says Monté. The five designs are the Juicy Salif by Philippe Starck, the 9093 Kettle by Michael Graves for Alessi, EM77Jug by Erik Magnussen for Stelton, The Dombo by Richard Hutten for Gispen, and the Aalto Vase by Aino & Alvar Aalto for Iittala. After Spazio Nobile, it is anticipated that the work will be shown at the Venice Art Biennale 2017 and WantedDesign Manhattan during NYCXDESIGN in May 2017. 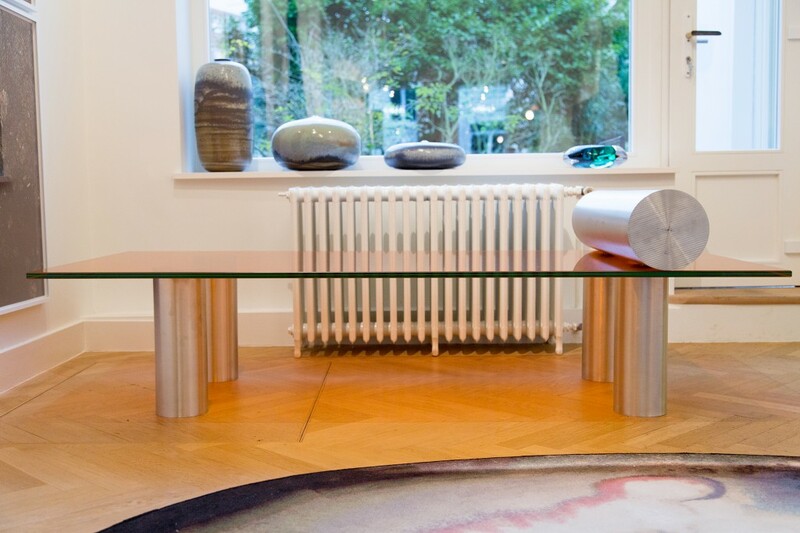 Also visualising the impact of time on design and our lives is the Day Bed in aluminium and glass by Studio Dessuant Bone and Allaert Aluminium. 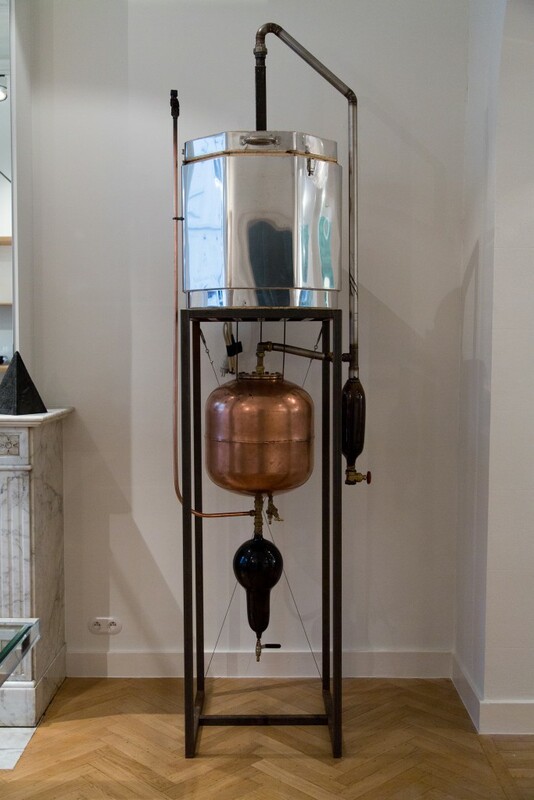 Following on the success of Perpetual Motion at Biennale Interieur 2016, the work represents a combination of industrial skills and know-how of over 60 years of production, Made in Belgium. The design language and aesthetic of Dessuant Bone transcends the room and is installed towards the garden at Spazio Nobile. 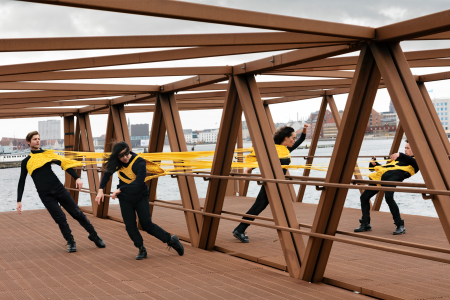 It manifests as a metaphor of time: time to slow down, to rest and to reconnect with nature in the city. Another call for pause is Liquid, a series of wall mirrors that plays with optical textures by Taeg Nishimoto. 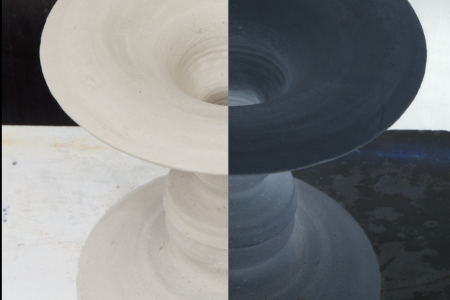 A partially distressed circular mirror is embedded into cast concrete with pigments that document the flow of concrete while poured into the mould. The combination of flowing patterns of pigmented concrete and the distressed part of the mirror creates a new layer. Liquid draws our attention to the surface pattern of both mirror and concrete disk as optical texture as we look closely at the reflection on the mirror. This texture is in fact a visualisation of the natural phenomena of liquid movement captured in a brief moment (while also evoking the image of the moon in the night sky with moving clouds). In this moment is the essence of Crystallized: long-term natural forces that seem invisible until we pause and look to find a new idea has materialised. Finding that impulse to pause and look lies in the act of love, ala Stendhal (read more about how Stendhal inspired the exhibition here). 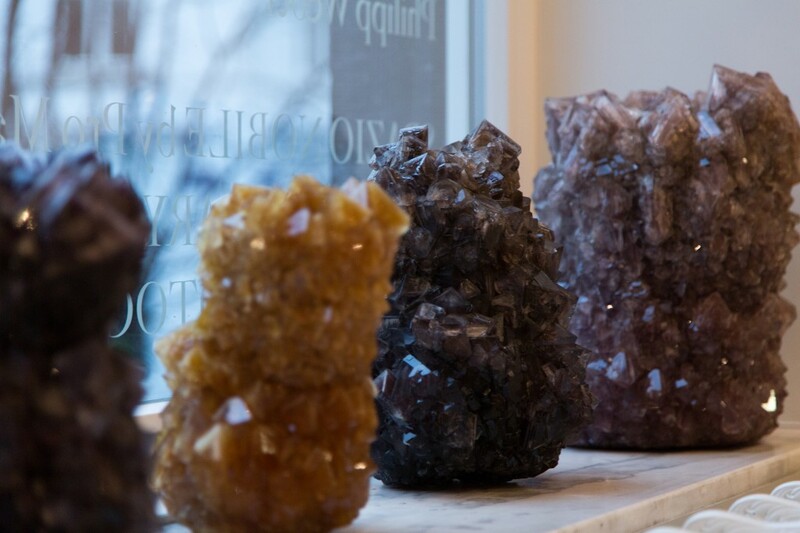 In Crystallized, love is the basis of sustainable design. 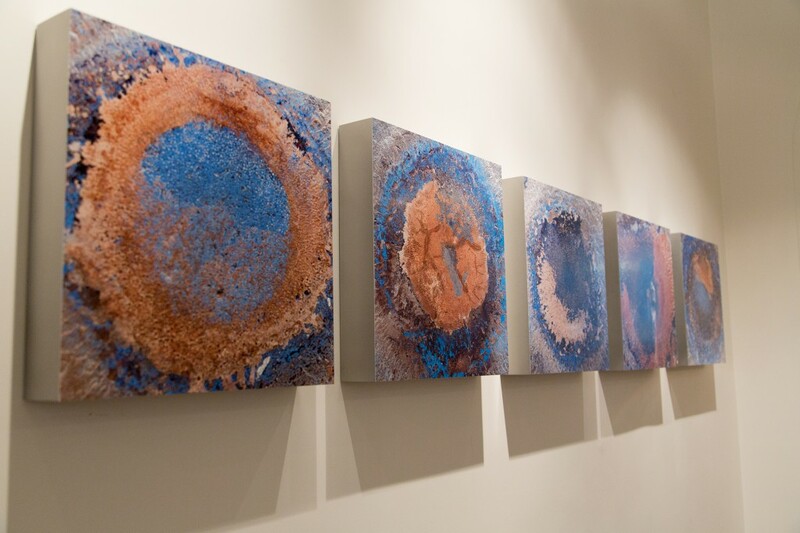 Installation of large scale contemporary soft glazed ceramic sculptures with signature-made crystalline compositions by Antonio Lampecco, unique pieces, after 2000. 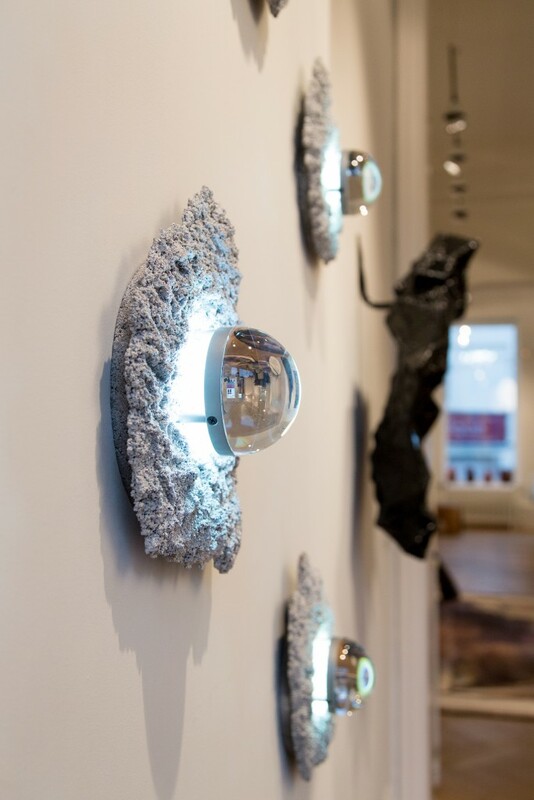 Wall installation of five Caviar sconces by Chen Chen and Kai Williams, silver shots, illuminated glass lens, 2017, in collaboration with Patrick Parrish Gallery, New York. 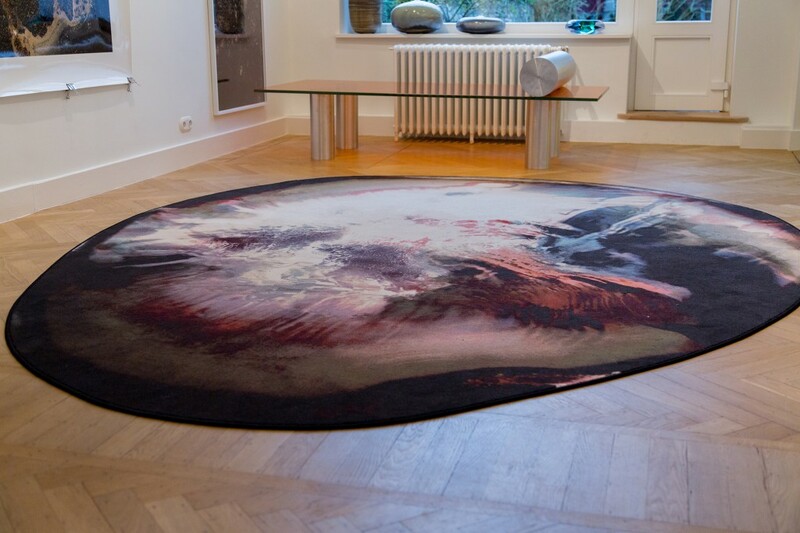 Meteoric Stone by GGSV, bespoke digital printed rugs, acrylic, inspired by the mineral world of marble and stone, 320 x 250 cm, 2017, in collaboration with Ege Carpets (DK). Available in wool on demand. 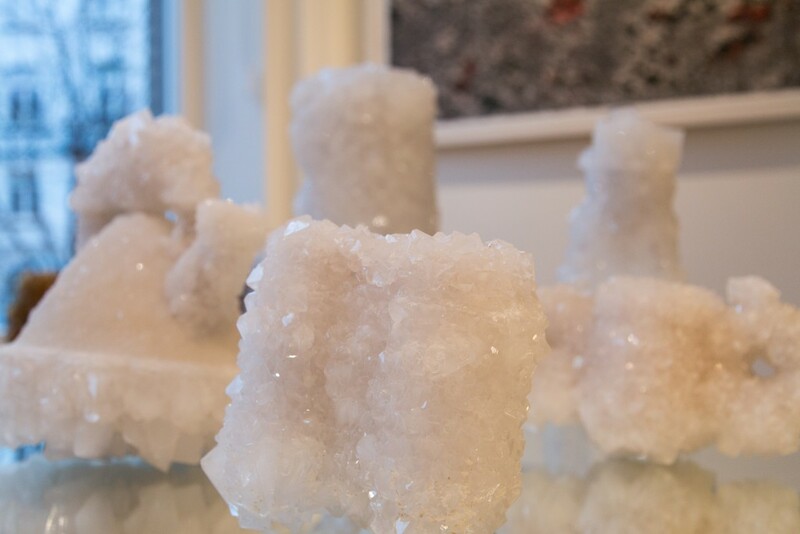 Installation view of Crystallized exhibition at Spazio Nobile.